and cannot be expected to walk straight, either in body or mind. Modern Science confirms the ancient philosopher. Become a total abstainer and join the Sons of Temperance. 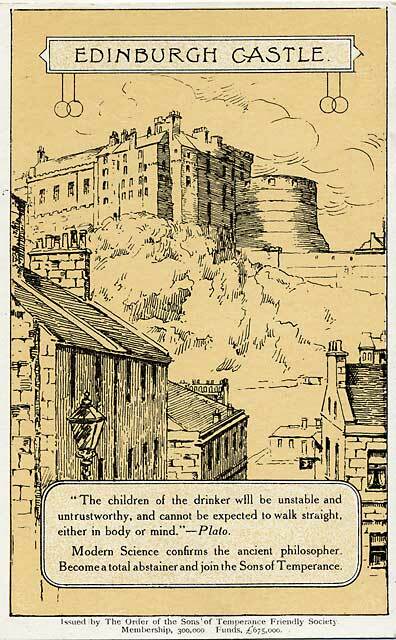 This card looks from the south, across the Grassmarket towards Edinburgh Castle. When was this postcard published? 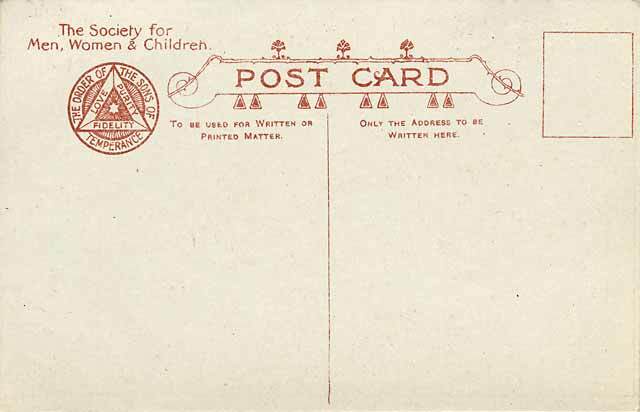 This postcard has not been sent through the post and is undated, but a little research should give the approximate date that it was issued. The society is described on the front of the card as having a membership of 300,000 and funds of £675,000. If you can use this information to determine the approximate date of the postcard, then e-mail me with your conclusion, that would be good! "I have this copy of this postcard in my collection. It also is unposted. However, I have another card the same series. It was posted in 1920." Jim Livingston, Nottinghamshire, England: February 29, 2008.